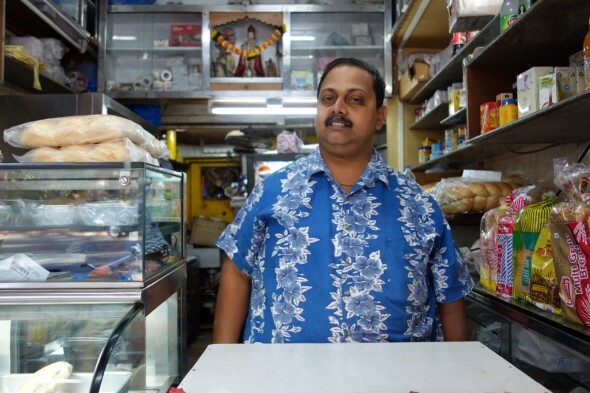 Meet Nobby, the man behind ‘St Stephen Goan Fast Food’, a little hole in the wall on Malabar Hill in Bombay from which he serves (up to) an impossible 2000 people a day. It’s just opposite the Hanging Gardens where the city’s children come to play and brightly coloured saris can be seen twinkling among the trees. After a day in the sunshine people queue in hoards for Nobby’s green chutney sandwiches, cutlets, bombay duck fry, fish recheado and for his wife’s sublime rum and chocolate mousse. I badgered, lobbied and blitzkrieged Nobby for his recipes and he said he couldn’t possibly hand them over because, like many Indians, he never writes the quantities down. Every morning he adds ingredients ‘to taste’ until everything is ‘just right’. His wife, is different, he said (which is why they get along) and then he handed me her prized rum and chocolate mousse recipe. It is a mousse born of love: a silky, densely-textured and intoxicating number and unless you can make your way up to Malabar Hill anytime soon, I strongly urge you to make it. Fill a saucepan with a couple of inches of water and bring to the boil, then turn the heat down to a simmer. Break up the chocolate into pieces and pop them along with the butter into a bowl, large enough to sit in the saucepan without it touching the water. Leave the chocolate and the butter to melt slowly, stirring infrequently for around 10 minutes until it has completely melted. Then whisk the blended yolks into the chocolate and once mixed, slowly whisk the cream, vanilla essence and rum into the mixture. Now pour the mixture into six little pots and refrigerate for an hour or two so that it sets. Having tasted this mousse, the veg cutlets, the chutney sandwich and the veg cheese toast from Nobby’s at your pad, I can vouch for it. Absolutely decadent!